Your Sacred Gifts have been with you all along, and yet, you might never have realized what they are. Knowing about them, and using all of them changes everything about how happy and fulfilled you feel in your life. feel more purposeful and intentional in your life. DISCOVER YOUR SACRED GIFTS FROM HOME! Join the next group starting soon or ask details about doing the process individually. We can meet from the comfort of your home on the phone (or skype) or in person. See below how to get a FREE 45 MINUTES PREVIEW of the program. meaningful work and activities that align with your gifts. Which of the 24 Sacred Gifts were placed within you? The answer will change you. Which of the 24 Sacred Gifts were not placed within you? The answer can set you free. + a 5th bonus live call with a very special guest. Stay tuned! “Wow! Everyone in the world needs this. I am so grateful to know that I don’t have to feel guilty over the gifts I don’t have. The dates of the next group will be confirmed shortly. We will meet for a 4 weeks teleclass serie + a special bonus call with a special guest. You can do this from the comfort of your home by phone or Skype, we are meeting for one hour each to 90 minutes week live on the phone . Live attendance is strongly encouraged and preferred on EACH CALL! However, all calls will be recorded. Therefore you can join in live (preferred), learn at your own pace with the recordings or both (join live and refer later to the recordings). You will be guided step-by-step through the whole program and what to do when. If you would like to do the program individually, or at another time, contact Fabienne to decide on the best option for you. You can receive a FREE 45 minutes preview of the audio program to help you confirm that it resonates with you. Complete the feedback form and mention that you would like to receive the free 45 min preview, it will be sent to you by email. The value for the 10+ hours series is priceless! And valued at least at $300. For a limited time, you have the chance to participate in the full program described above while paying only for the audio recordings part of the program which is sold on it own for $147. That means that you will participate in the 4 interactive group coaching calls (and the 5th bonus call) absolutely FREE! To register and/or request your free 45 minutes preview, please contact Fabienne via the contact form to finalize everything. You can pay the $147 by PayPal, US check or Bank Transfer. You will receive an official payment confirmation, your access to the audio recordings, and your conference call number and access code for the live interactive calls. Any questions or feedback, just ask. You may know one or two of your gifts but do you know them all? Are you aware of what can happen when they all synergistically come together? FIND OUT! - And... exactly how to do it... step-by-step... so you always know what to do when! What are the SACRED GIFTS? 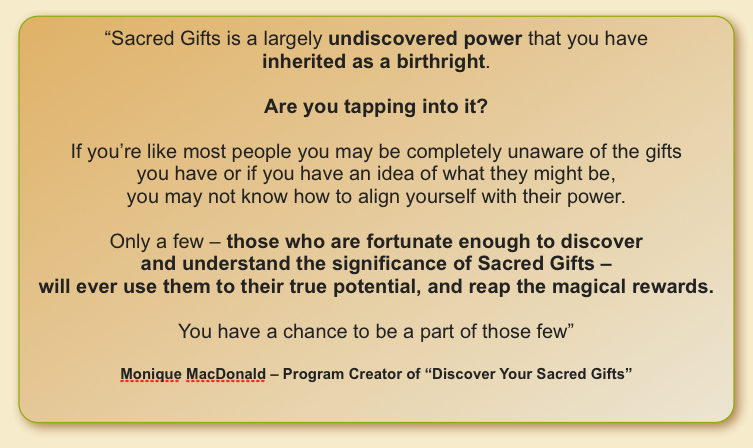 Sacred Gifts are abilities that we have access to but that few people actually tap into. Some know they have gifts, and are using them. Other have no idea that they have gifts. Sadly, many people go through their entire lives with their gifts asleep, unopened and unused and this can cause them to miss out on experiencing some of the most fulfilling and rewarding aspects of their life. It doesn't have to be that way. Sacred Gifts are like a set of power tools. They show you what you are equipped to do naturally and most effectively. When you combine these natural gifts with activities or work that really is meaningful to you and that makes you feel on purpose the results can appear at times to be supernatural. This means that your gifts can go above and beyond what you might think is possible for you to do. You want to know what power tools you have in your tool box and how to use them. It is my honor and privilege to guide individuals and groups through this beautiful and powerful process. Let me know if you would like to receive the FREE 45 minutes preview of the program that I am happy to share to help you confirm that it resonates with you. Complete the feedback form and mention that you would like to receive the free 45 min preview, and I will send it to you. If you have already received an email to access the free 45 minutes preview, please click here. Very much looking forward to sharing this fascinating and marvelous journey together!